My partner and I are both very close to getting reward status by the end of the year, each on a different airline. We are considering making a quick weekend trip to put us over the edge, but we don't want to pay for the trip only to find on our return that we fell just short. Counting out the miles seems pretty simple, but now most airlines require qualifying dollars as well, which doesn't always seem to be straightforward. Aside from going well above the required amount, how can we ensure that our flight will give us the points we need to qualify for our status? In particular, how can we determine how many Qualifying Dollars we will get from our flight? When you book your flight, it'll tell you what your Premier qualifying miles (PQM), Premier qualifying segments (PQS) and Premier qualifying dollars (PQD) are. 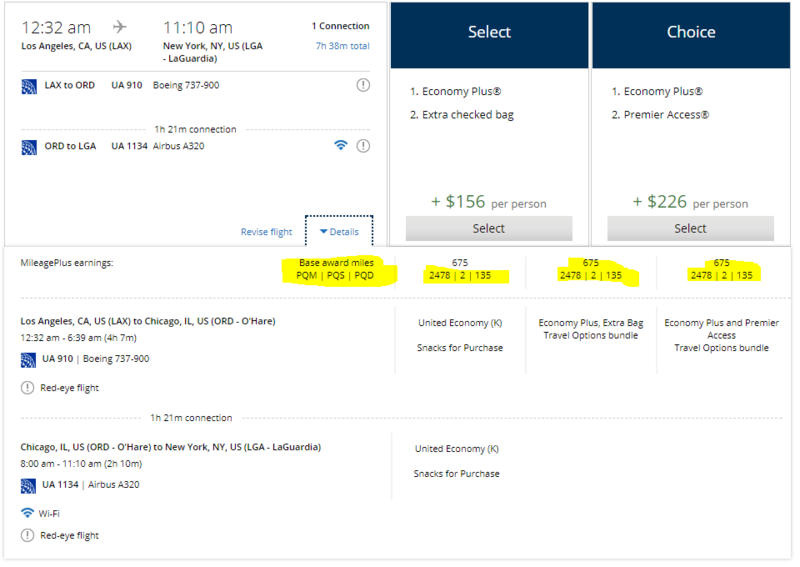 Attached is a screenshot of a sample flight on United, with the details highlighted. When in doubt, you could just call/email the airline to get confirmation. Perhaps emailing would be better so that you'd have a paper trail in case there's confusion in the future. Michael is correct that the airline's website will usually tell you how many redeemable miles, elite-qualifying miles, and elite-qualifying dollars you'll earn on a particular trip. As shown below, in Delta's case, this occurs on the flight check-out page instead of the flight selection page. I would additionally note that elite-qualifying dollars are normally based on the fare alone, not including taxes and fees. As you can see from this example on Delta, the flight costs $90.20 total, composed of $70.70 in fare and $19.50 in taxes and fees. Yet, only 71 MQDs (Medallion Qualifying Dollars) are earned. This is the same flight, but in economy+ (which Delta calls "Comfort+") instead of economy. Since the upcharge for economy+ is considered part of the fare by Delta (except for the taxes on the upcharge,) the flight earns 89 MQDs instead of 71. It's also probably worth noting in the example here that 500 MQMs (Medallion Qualifying Miles) are earned for this particular flight. This is not a coincidence; those cities aren't actually 500 miles apart. Instead, Delta credits a minimum of 500 MQMs for any particular flight segment on Delta metal. Even if the flight is only 50 miles, you'll still earn 500 MQMs. TL/DR: AA.COM tells you exactly how many EQD's you will earn when you purchase the ticket. As a veteran of many mileage runs, don't wait. If you're that close, fly now so you have some time to make that last run if needed. Not the answer you're looking for? Browse other questions tagged airlines loyalty-programs united-airlines american-airlines or ask your own question.